A population of about 800 apes living in the Sumatran mountains are genetically distinct, a new study says. On November 20, 2013, the Sumatran Orangutan Conservation Programme got a call about an injured orangutan found in the mountainous region of Tapanuli. "He had cuts on his face, on his head, back, hands, and legs," recalls researcher Matt Nowak. "They even found some air rifle pellets inside his body"—indicating torment and harassment by people. Despite veterinary treatment, the orangutan, named Raya, died eight days later. But Raya lives on as the representative member of a new orangutan species, Pongo tapanuliensis, or the Tapanuli orangutan—the rarest great ape species on the planet. population numbers only around 800 individuals. numbers only around 800 individuals. That's because the Batang Toru animals are more closely related to their counterparts from Borneo, across the sea, than to other orangutans living on the same island. Until now, science recognized two species of orangutan: The Sumatran and Bornean, both of which are also critically endangered. "It was always assumed … these guys were Pongo abelii, the Sumatran orangutans," he says. An Australian National University graduate student named Anton Nurcahyo had been scouring the world's museums in search of orangutan bones. When it came to Batang Toru specimens, he came up empty-handed. Knowing this, Nowak made sure to preserve Raya's skeleton. The results, published November 2 in the journal Current Biology, show that Bornean orangutans, Sumatran orangutans, and the new species from Batang Toru comprise three distinct evolutionary lineages. Incredibly, the oldest lineage belongs to the newest species. Then, some 600,000 years ago, a second split occurred—this time between the original population south of Toba and the orangutans that went on to settle in Borneo. 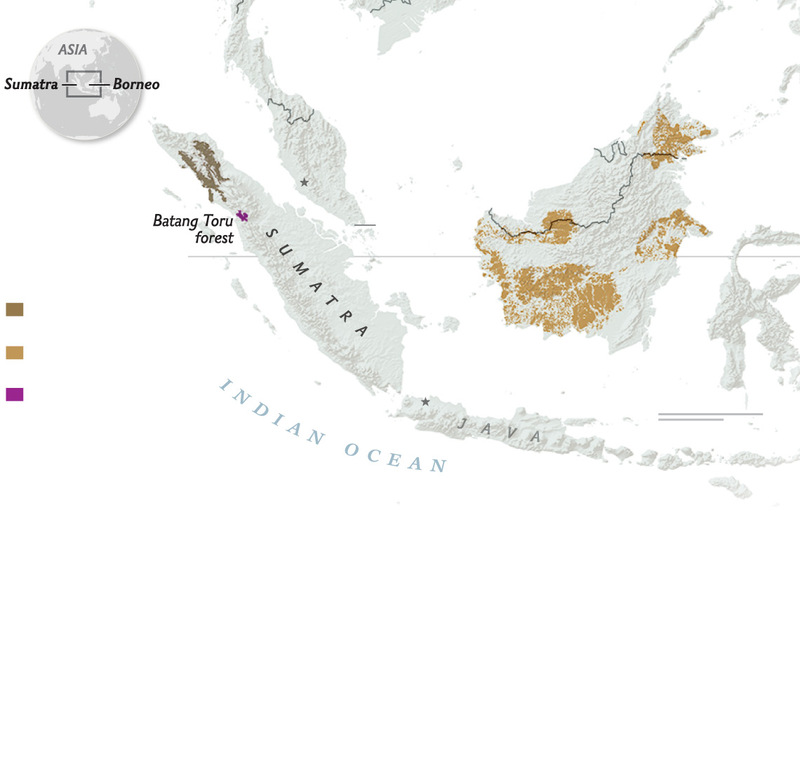 As ice ages progressed and sea levels changed, orangutans moved effortlessly between landmasses—which explains how the Batang Toru orangutans could be more closely related to those from Borneo. Lastly, University of Southern California graduate student James Askew found that calls made by Batang Toru males vary from calls he recorded elsewhere on Sumatra and on Borneo. Sumatran orangutans produce calls that are long and low-pitch, while those on Borneo belt out calls that are shorter and have a higher pitch. The calls of Batang Toru males were mixed: long, but high-pitch. "It's amazing that the deepest genetic split between living orangutans has been overlooked until now," says Kris Helgen, a mammalogist at the University of Adelaide in Australia. Helgen cautions that the study is just a starting point, and it's crucial to continue collecting new Batang Toru specimens, when possible, for further analysis. That's especially important because fewer than 800 of the great apes remain in Batang Toru, split into three fragmented areas. "Many overlooked species, like Pongo tapanuliensis, are endangered," Helgen adds. "It is urgent and crucial to accurately document them and give them scientific names, so they can be recognized as distinctive, studied in greater depth, and protected from extinction." Follow Jason G. Goldman on Twitter, Instagram, and Facebook.